Someone came by the blog the other day, having put the phrases ‘Cruises round Sydney Harbour in the Bounty or Endeavour’. 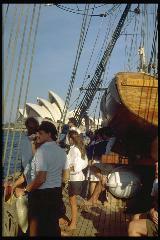 Now, I did cruise around Sydney Harbour on the Bounty replica in 1991, and looked for her especially on my last visit. Unfortunately, she wasn’t in Sydney at the time. I’m interested in both ships, and in the life and times of their captains, James Cook and William Bligh. I’m the author of the articles Mutiny and Cook’s Great Endeavour, which appeared in History for All magazine some years ago … unfortunately, the magazine ceased publication before the sequel to the latter, Cook’s Resolution could appear. I haven’t sailed on … or even seen the Endeavour replica, although I’d like to. 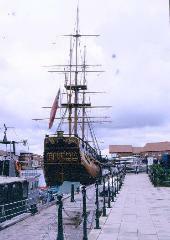 I have, however, visited the ‘Tin Endeavour’ … a faithful, non-seagoing replica in steel at Stockton on Tees. Although there’s no record of the original Bounty ever calling at Sydney, her captain, William Bligh, did eventually become Governor of New South Wales. And, in this capacity, he briefly arrested one Mayhew Folger, the captain of the Boston sealer Topaz, on suspicion of ‘rum-running’. And, after his release, Folger returned to America … and, on the way, discovered Pitcairn Island, where the Bounty mutineers had settled. More connections …William Bligh sailed as Sailing Master to James Cook in ‘Resolution’; the crew of the ‘Endeavour’ are believed to be the first people to brew beer in Australia, and Governor Bligh’s daughter is said to be the first to make wine! The Endeavour Replica is berthed at the Australian Maritime Museum in Darling Harbour, Sydney. She voyages to other towns and cities on the East coast. Check the museum website for more information. I have seen the Endeavour but have never actually sailed on her. Quite a magnificent vessel. Does she do ‘trips around the harbour’, or longer ones, with a definite destination in mind?